The roses we used in Casey’s bouquet were Amnesia and Quicksand. Both of these needed to be imported from Ecuador and were particularly expensive. Although we worked hard to find less expensive substitutes, Casey was quite a discerning bride and wanted to stay with her original choice. 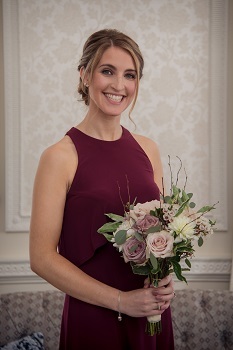 For Casey, the flowers and the colours were a very important part of her wedding. 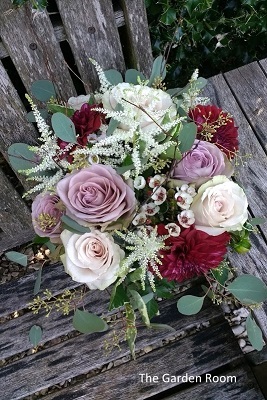 The addition of burgundy dahlias, ivory astilbe, white wax flower, eucalyptus and birch twigs completed the bouquet designs. 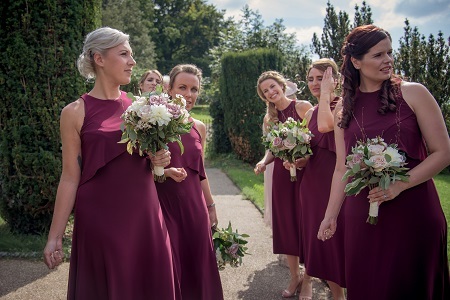 We substituted white dahlias in the bridesmaid’s bouquets so that they would stand out against the burgundy dresses. 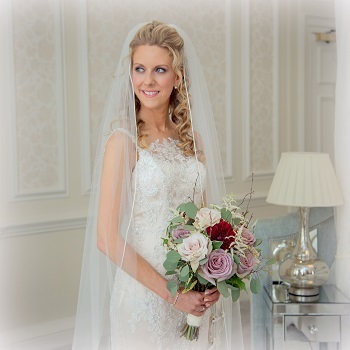 When we delivered the bouquets to Hedsor House, Casey was quite overwhelmed. 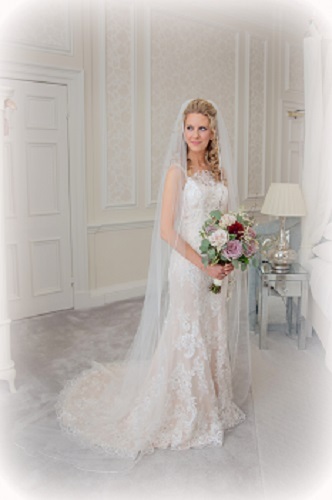 We have seen some very sweet moments with our brides but we were particularly touched by Casey’s reaction. 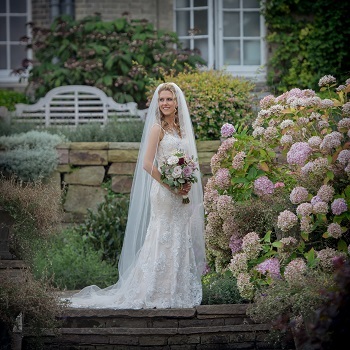 Meyer and Rene took these stunning images of Casey in her dream dress before the ceremony. 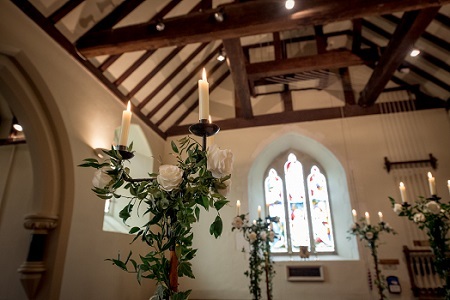 While the bride and bridesmaids were getting ready, we were busy decorating the historic St Nicholas Church at Hedsor. 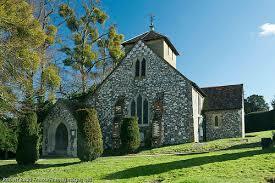 The church is known to date from the end of the 12th century. It has a spectacular location and is a stone’s throw from Hedsor House. 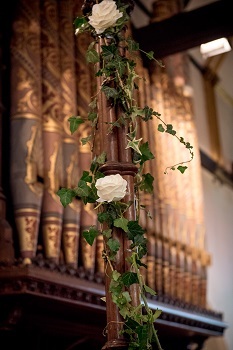 Jenny, who looks after the church, was so helpful and shared her thoughts with us on the decoration options for the church prior to the event. 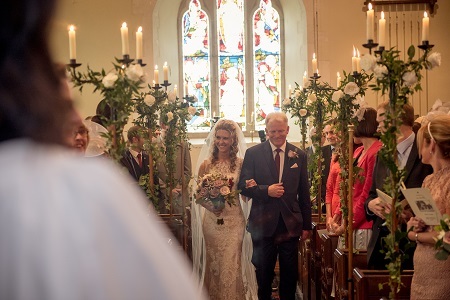 She was also present on the day itself and helped us to attach the ivy and roses to the candle sconces and either side of the entrance to the Sanctuary. Thank you, Jenny. You were wonderful! 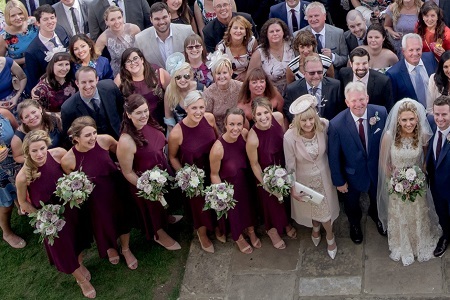 Here are some photos of the bits we missed: Casey and her dad arrive at the church, Oliver and his father, and the bridesmaids’ group shot. 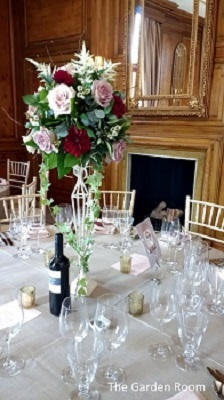 While everyone was busy enjoying the ceremony, back at Hedsor House we were busy decorating the function suite. 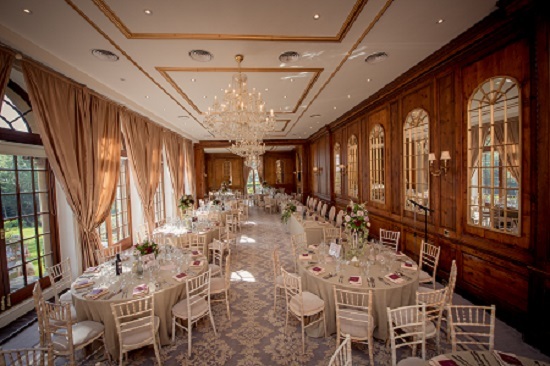 It was a stunning room, brought to life with our chosen flower decorations. Below, you can see why our reference to the high life is so apt. As an exclusive-use venue, Hedsor House can become your very own quintessential stately home and country playground for 24 hours. Dating from 1166, the house is set in 100 acres of beautiful parkland. It has an illustrious history welcoming regal guest in past years and now Hollywood celebrities. 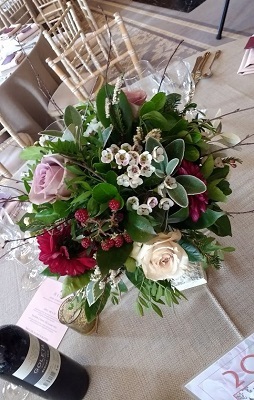 We used flowers in the reception room to complement the bouquets. 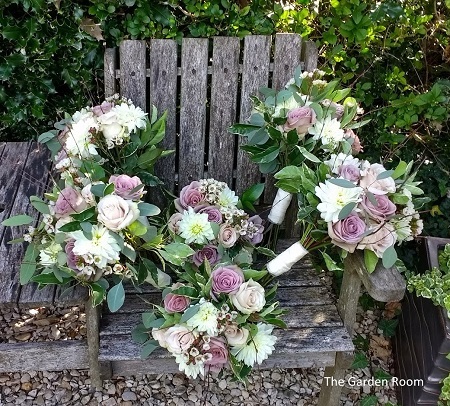 We set the tall arrangements on our cream, shabby-chic metal stands and the short in small cream urns. 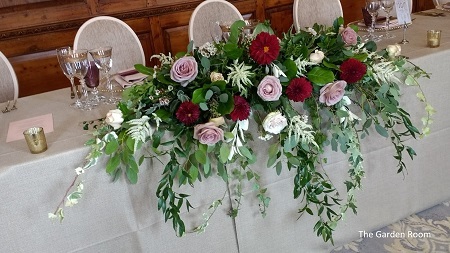 Casey had chosen table cloths of natural coloured linen which set off the flower designs beautifully. The addition of coloured table cloths and napkins can make a huge difference to the look of your table settings. If you’d like to explore this option, we can recommend one of our partners to help you with different colours and styles. 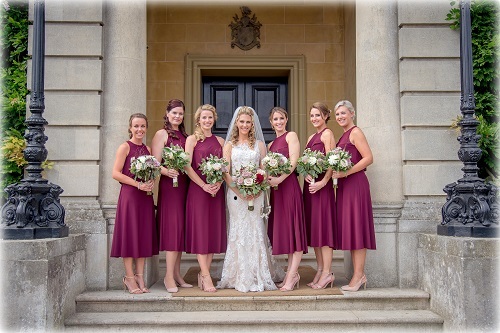 Let’s take a final look at Casey and her bridesmaids on the steps of Hedsor House, and Oliver and Casey with friends and family below. Thank you once again to Meyer and Rene photographers for the images used in this article. 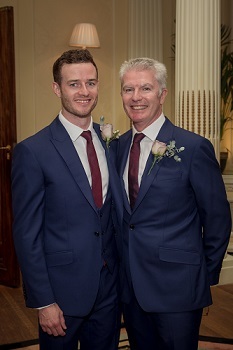 Our biggest thanks go to Casey and Oliver for sharing their special day with us. We hope you’ll be very happy together, forever.